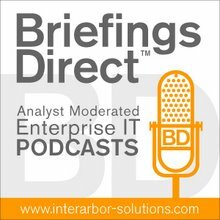 The next BriefingsDirect big data trailblazer interview examines how New York-based adMarketplace, a search syndication advertising network, has met its daunting data-warehouse requirements. Learn here how adMarketplace captures and analyzes massive data to allow for efficient real-time bidding for traffic sources for online advertising. And we'll hear how the data-analysis infrastructure also delivers rapid cost-per-click insights to advertisers. Listen to the podcast. Find it on iTunes. Read a full transcript or download a copy. Join MyVertica. For the inside story, BriefingsDirect sat down with Michael Yudin, the Chief Technology Officer at adMarketplace at the recent HP Discover 2014 Conference in Las Vegas. The discussion is moderated by me, Dana Gardner, Principal Analyst at Interarbor Solutions.